Recently, I find a special 20 years old Hei Cha called Liu Bao. The tea has been kept in my warehouse for 10 years. It is loose leaves in a big bamboo basket(60kg). 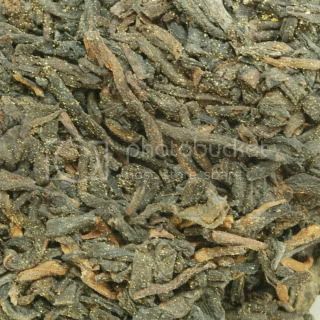 This is black/shou tea that has similar taste as Pu-Erh tea. The special about this tea is it has lot of "golden flowers" found from the tea as shown in the pictures. "Golden Flower" recognized as Eurotium cristatum. 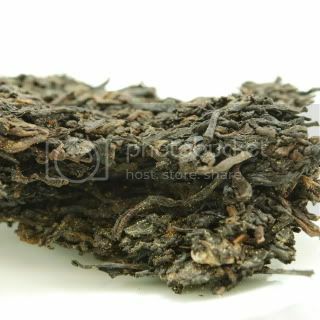 It is usually fond at Fu Zhuan tea brick or Liu Bao, but arely in Pu-Erh. I'm curious how people think about the "Golden Flowers". 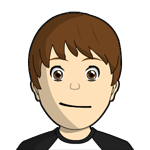 Does anyone has any idea or information? please share with us. I guess it's supposed to have that stuff on it? How does it affect the brewing & taste of the tea? Oriental Beauty leaves need to be bitten by bugs and puer is composted to grow bacteria, so as long as it's safe I guess I'd give it a try. I have brought some samples of the 16 year old Fu Zhuan from you. It tastes very smooth and sweet. It is also cooling with a "comfortable" herbal taste. I highly recommend this tea. The golden flower should be similar to fungus/mushroom. I guess it should enhance the tea's taste and its nutritional benefit. Daniel Lui and I tried this Fu Zhuan tea 3 years ago and I thought it was horrible. We tried it again 3 months ago and it was fabulous - I bought 2 bricks right away. I call the initial taste a bubblegum sweetness which reminds me of old and very old pu-erhs. Daniel once made me a 1940's Blue Paint tea which I'll never forget and had a similar sweet characteristic. I had a similar experience with Daniel's Kir Zhi Xing which was first like drinking a campfire. After storing in clay for a year, it changed and the smoke taste disappeared and a wonderful floral taste emerged. There's also the Red String Green Brick Pu-Erh which is shaping up the same way. Lovely! Is it true that older the tea gets the tastier it becomes? I have heard so about Liu Bao tea, the taste changes if you keep it longer. I don't know the scientific reason behind it, but I really like drinking Liu Bao. No all teas can be aged. Post-fermented teas like: Pu-Erh, Liu Bao, Fu Brick, Liu An etc. can be aged. Some traditional Oolong teas and some white teas also can be aged. Black tea can be aged, but it will loose the flavor and taste by aging. Age is one of the main factor to make tea taste better. Quality of the leaves, keeping condition, tea ware, water, the way of making tea are also very important. I never drink this one, I have ever drunk jasmine tea and the traditional tea. ginagreen What do you mean traditional tea?